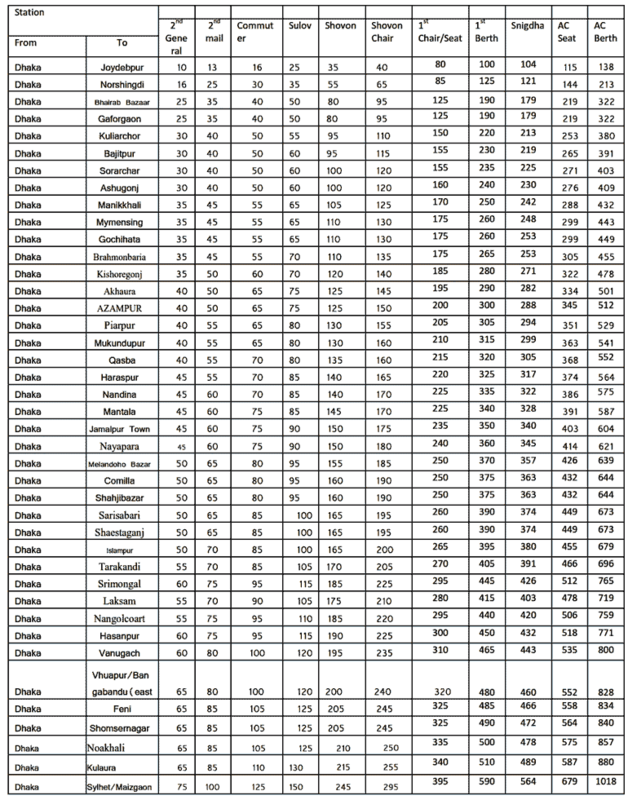 Trains from Dhaka | Latest Schedule and Ticket Price Bangladesh Railway. In recent few years Bangladesh Railway has shown a great improvement in the field of transport. Bangladesh Railway is working heart and soul to provide safe, reliable, cost effective and time efficient rail transport service for the passengers. There are various kinds of trains under Bangladesh Railway such as Intercity, Mail/Express, Demu Commuter, Suttle/Local Train etc. This post deals a great description about Dhaka Train Schedule which was updated in June-July 2014. You can know details about Dhaka to Chittagong Train Schedule, Dhaka to Khulna Train Schedule, Dhaka to Rajshahi Train Schedule, Dhaka to Sylhet Train Schedule, Dhaka to Mymensingh Train Schedule from this post. This entry was posted in Train Service, Transport and tagged All Train Schedule of Bangladesh, Dhaka to Chittagong Train Schedule, Dhaka to Khulna Train Schedule, Dhaka to Mymensingh Train Schedule, Dhaka to Rajshahi Train Schedule, Dhaka to Sylhet Train Schedule, Dhaka Train Schedule, Trains from Dhaka, www.railway.gov.bd by Result Gov BD. Bookmark the permalink. but there showed 9:15.. what is this? ?